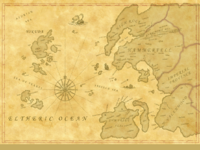 Akos Kasaz is the largest island in the Yokudan archipelago, between the Azurian Sea and the Sea of Pearls, far to the west of Hammerfell. The capital of the Yokudans, Totambu, was located on Akos Kasaz. In the late Second Era, other settlements included Tagon in the west, Taleskan in the north, and Yul in the south. Due to its size, the island spans multiple environments, some gentle and some brutal. Northern Akos Kasaz was a fertile steppe, home to large herding clans, some of whom worshipped the Herd Mother, rather than the typical Yokudan gods. This group left Yokuda in the sixth century of the First Era, eventually founding a colony in the Vale of Silverhoof in High Rock. This page was last modified on 21 October 2018, at 07:36.